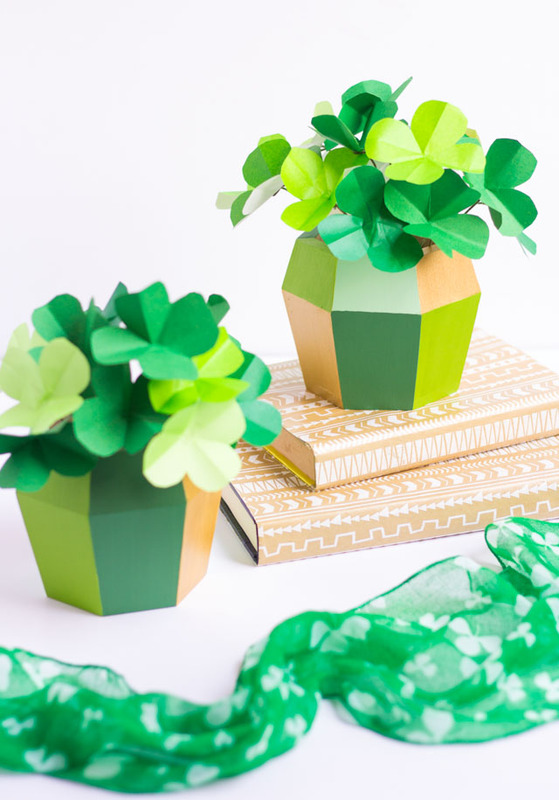 I’m so excited about how this St. Patrick’s Day project turned out! 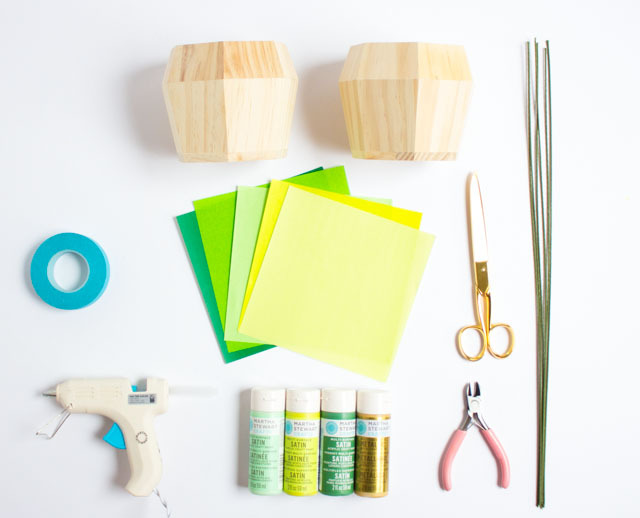 This craft is a fun one because it allows you to play around with a couple different DIY techniques – painting and paper crafting. 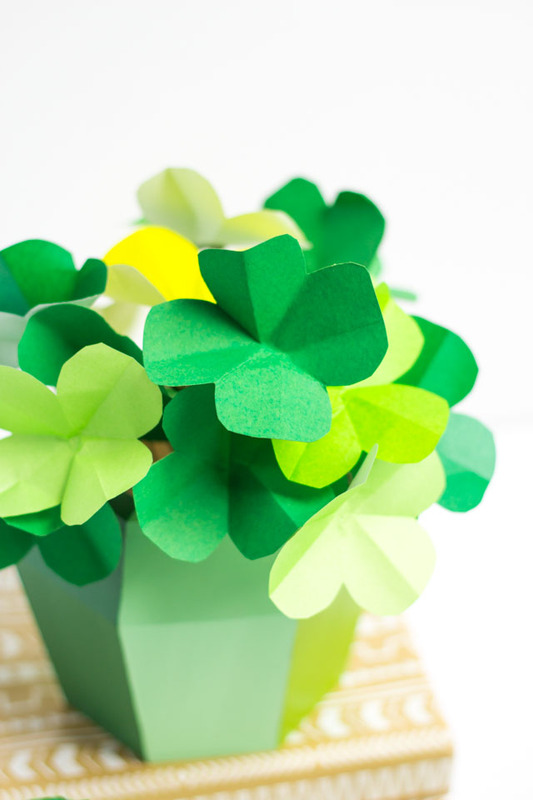 To make these DIY potted paper shamrocks I used a variety of my favorite Martha Stewart Multi-Surface Craft Paints along with a simple tutorial for making paper shamrocks. 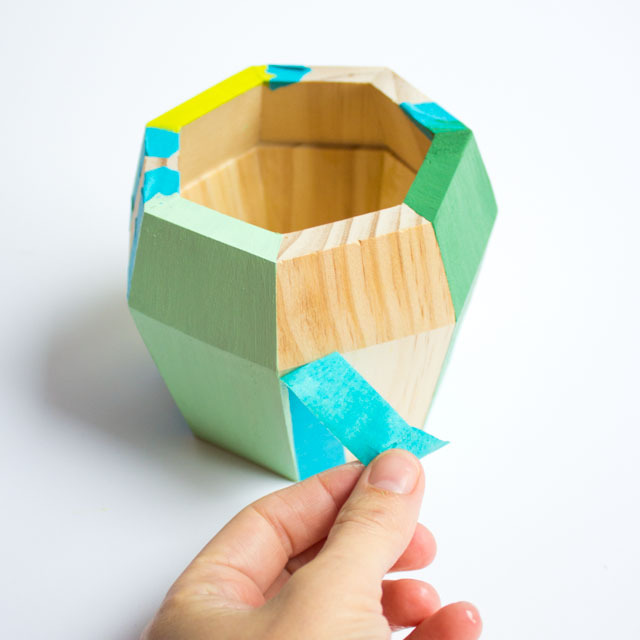 I love how modern they look when “potted” in these fun geometric wood planters. I think they may be chic enough that I could get away with keeping them up year round – what do you think? 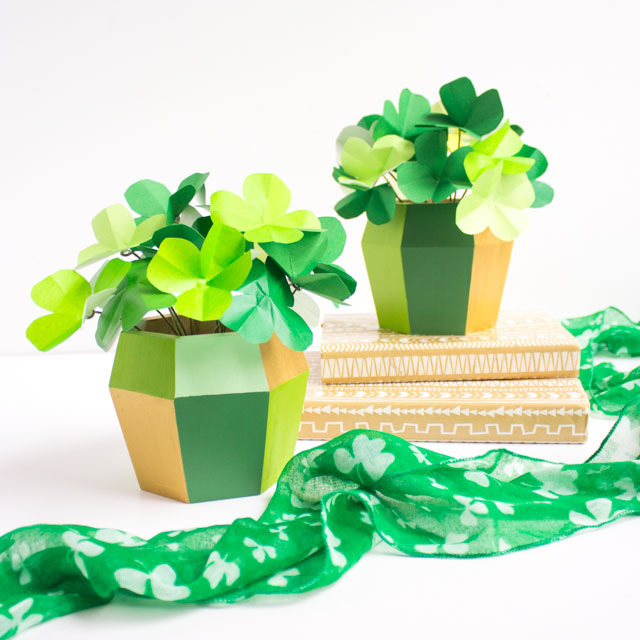 These shamrocks are made from a mix of origami paper and card stock – any green paper will work! 1. 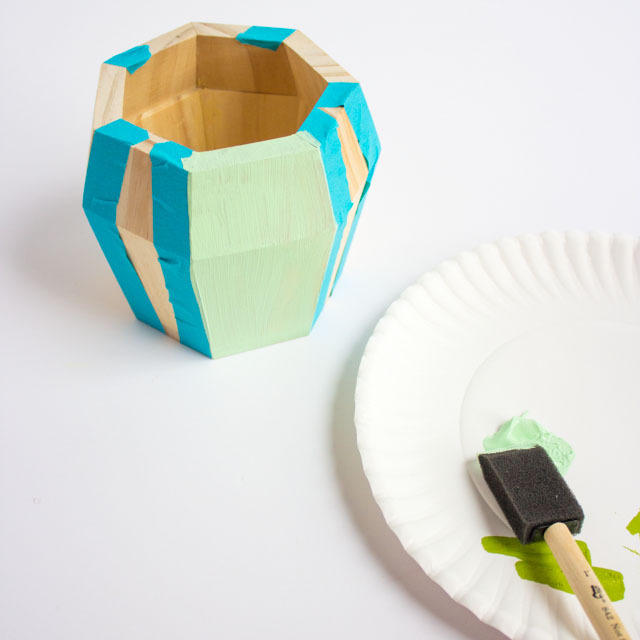 Use the stencil tape (or thin masking or painter’s tape) to section off different parts of your pot to paint. 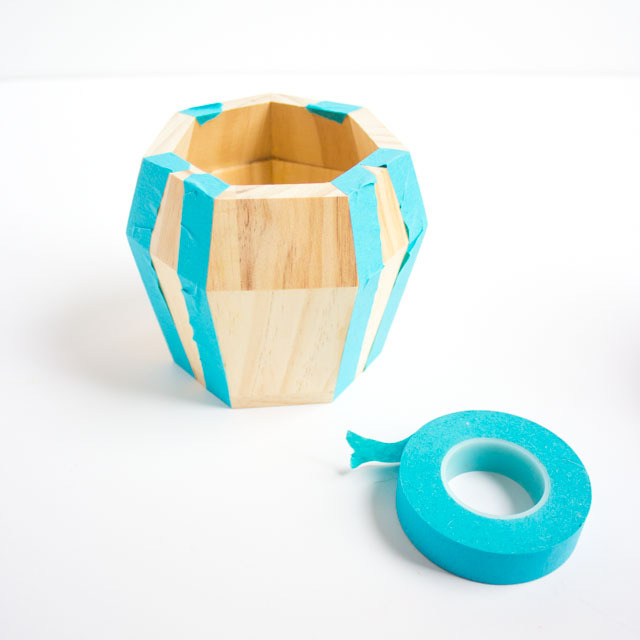 Run the tape right along the line and use your fingernail to smooth down so paint doesn’t seep underneath. If you have a steady hand, you can skip this taping step and just use your foam brush to carefully paint within each section of the pot. 2. Paint a section at a time, switching up the colors used in each section. Apply a second coat once the first coat is dry to the touch (15 minutes or so). 3. Once you have applied two coats, peel off the tape. Wait until the paint is fully dry before taping off the remaining sections. 1. 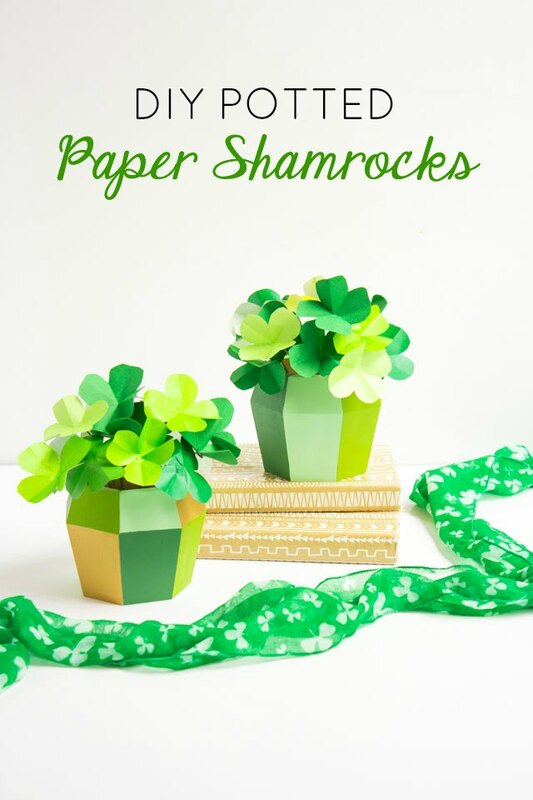 To make the paper shamrocks, I used 5.9″ x 5.9″ origami paper in various shades of green. 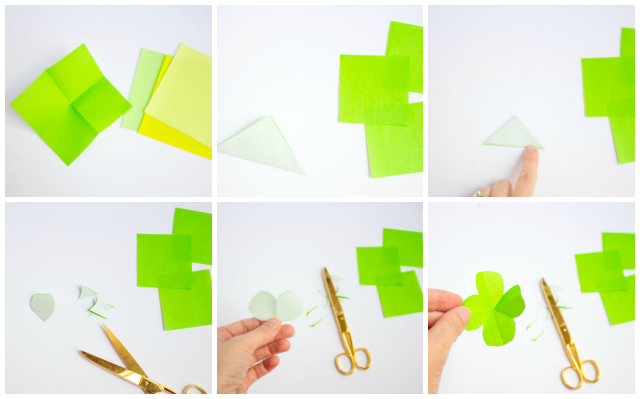 I cut each piece of origami paper into 4 squares and then followed this simple tutorial from Martha Stewart. 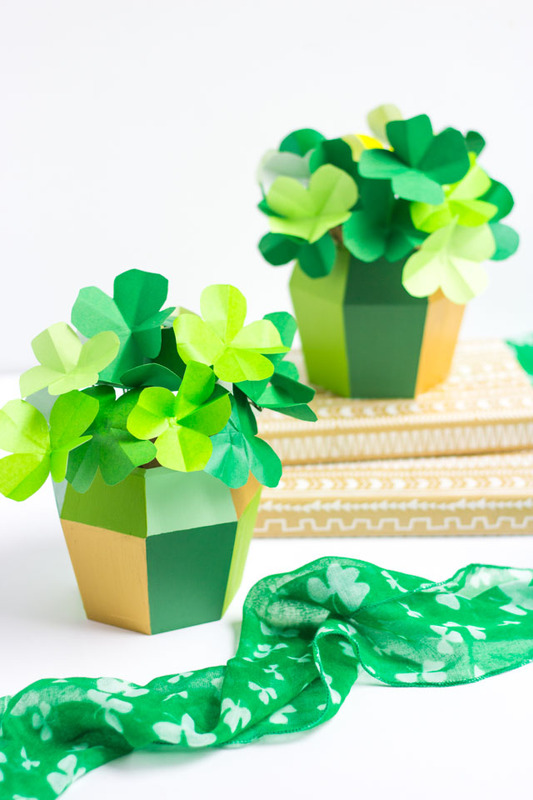 Each sheet of origami paper will make four shamrocks. 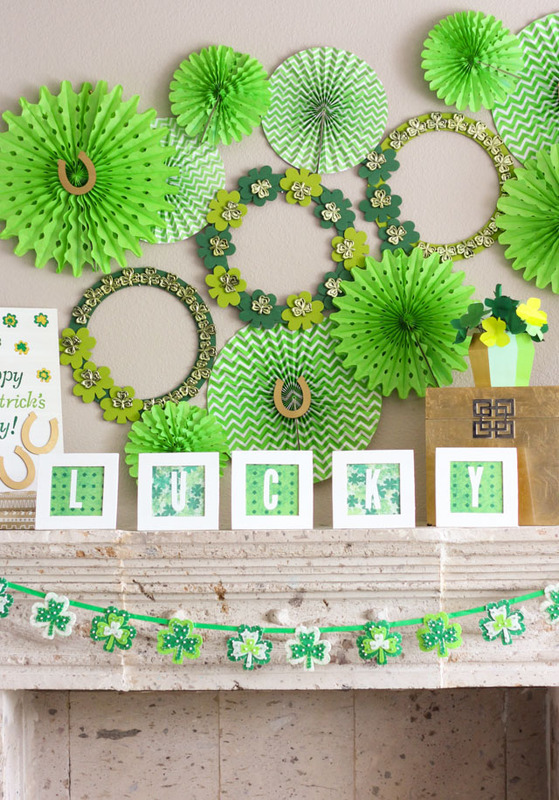 You can also cut green card stock into similar sized squares. 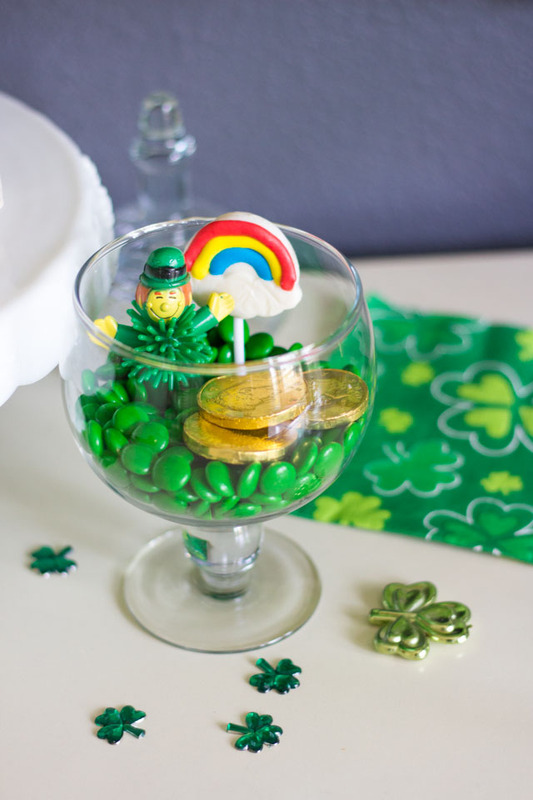 You’ll want about 20 shamrocks per pot. 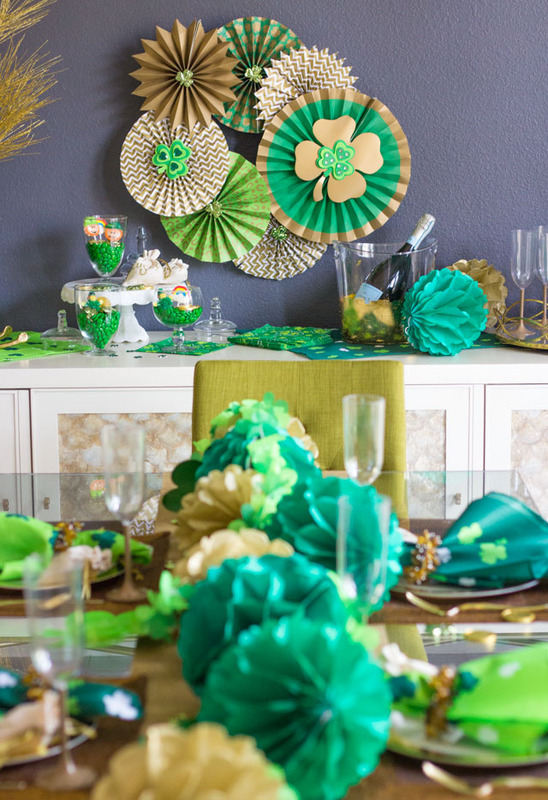 I like using a couple different shades of green to add depth to the arrangement. 2. 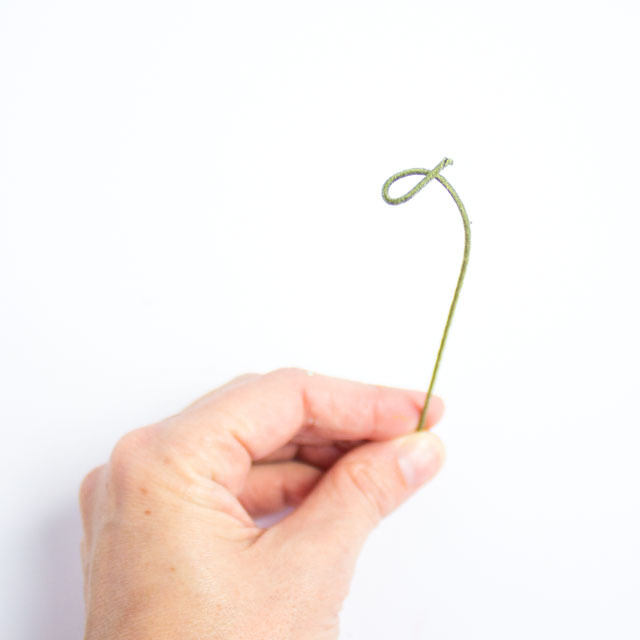 To create stems for your shamrocks, cut pieces of floral wire into thirds with wire cutters. 3. 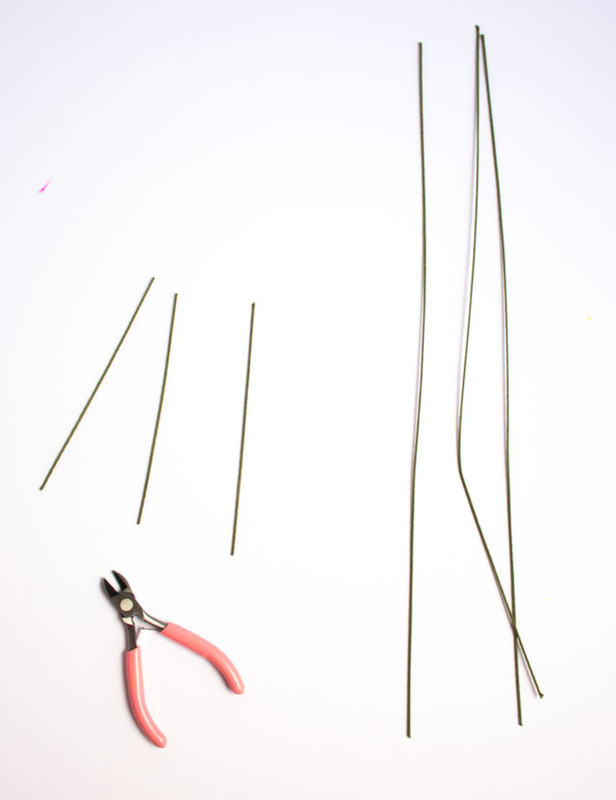 Bend the top of each short piece of floral wire to create a base for the shamrock. 4. 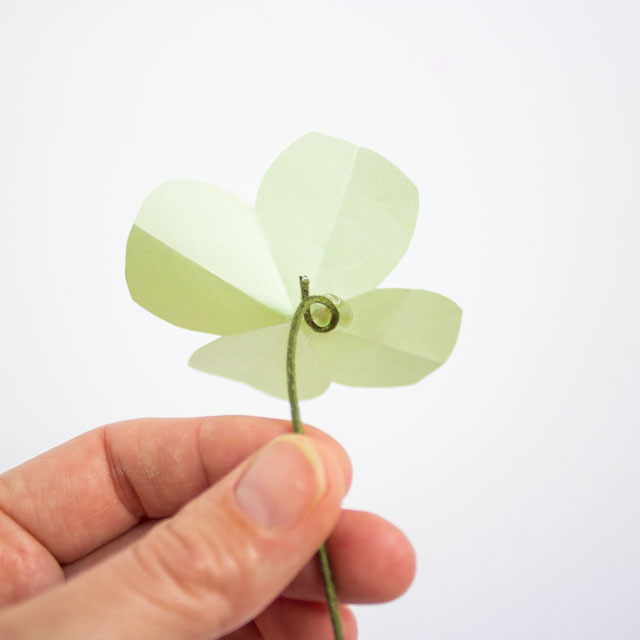 Add a dab of hot glue to the bent part of the floral wire and attach a shamrock to the glue. 5. 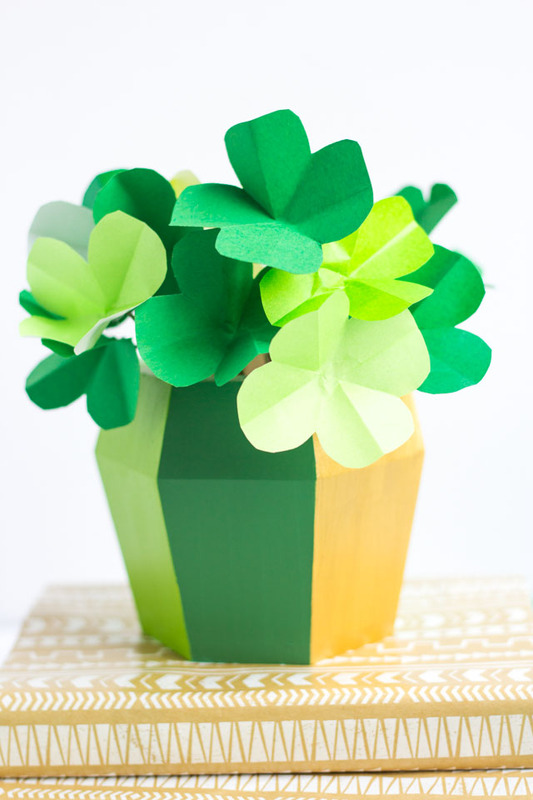 Cut a piece of floral foam to fit your pot and then stick the shamrocks into the foam. 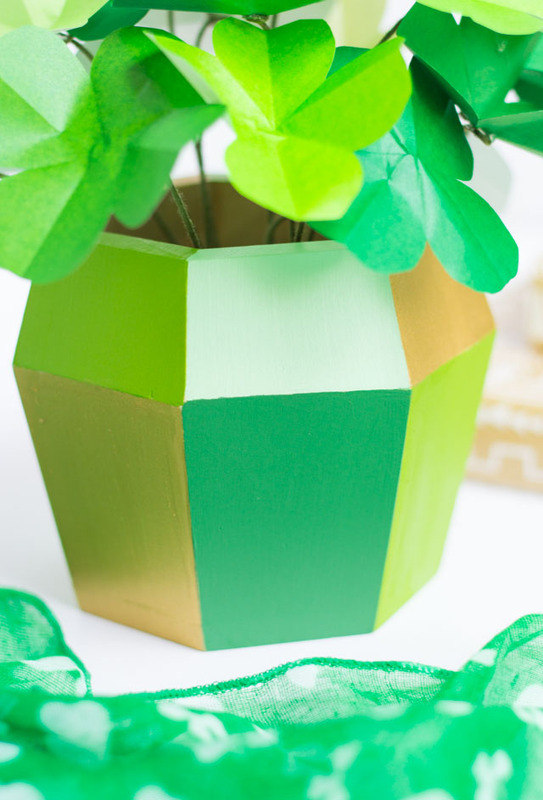 Aren’t these geometric pots so fun? Target has a couple different versions of them as part of their Kid Made Modern line, and at $3.99 a piece, they are a steal! So many ways you could decorate these. 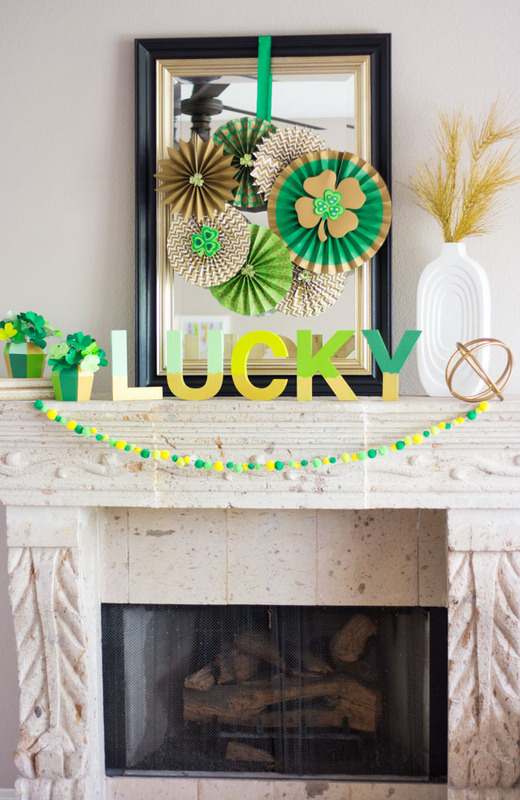 A Lucky St. Patrick’s Day Mantel!